When was the last time you had the belts and hoses checked on your car? Serpentine belt replacement, your automobile depends on its belting system to operate auxiliary devices from the power of your car’s engine. 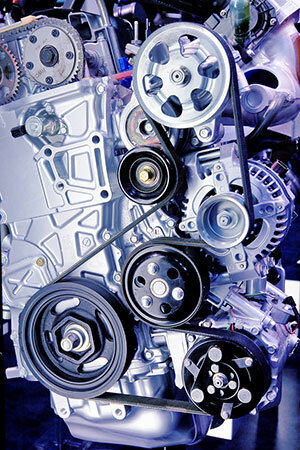 Power Steering, Air Conditioning, Pumps, Alternators and more all run by belt drive of your engines crankshaft pulley. Over time the environments extreme temperature swings and under hood heating along with miles of wear cause belts to fatigue and eventually break down either breaking, shredding or losing traction on the pulleys used to transfer power. Hoses are your cars veins carrying everything from engine coolant/antifreeze, gasoline, brake fluid and motor oil. The same environmental conditions that fatigue your cars belting systems over time also wear out your car’s hoses. If a hose were to fail your car might overheat, might stop in the case of a fuel hose failure or worse yet fail to stop in the event of a brake hose failure. Integral to proper automobile maintenance is regular inspections of your cars belting and hose supported systems. When found to worn or adversely affected by weather they should be replaced in order to ensure your auto continues to operate without a breakdown. Here at Bowe’s Exxon Car Care Center our ASE certified technicians can quickly check the condition of both your autos belts and hoses and recommend any preventative maintenance that should be done. Call us today to schedule a time for your belt and hose inspection before your next big trip!